The Alternative Energy & Power 2018 guide provides expert legal commentary on key issues for businesses. The guide covers the important developments in the most significant jurisdictions. Stikeman Elliott LLP 's national power practice supports clients through all phases of conventional and renewable power projects and related transactions. The firm’s complementary regulatory and commercial expertise takes clients from initial development and permitting phases through commercial operations. Stikeman Elliott also has substantial dispute resolution experience in the power sector, having represented clients in major arbitrations, administrative hearings, trials and appeals, including to the Supreme Court of Canada. In light of the increasingly complex world in which energy businesses operate, the firm also provides in-depth expertise in such critical areas as market design/evolution, environmental law and Aboriginal relations. Stikeman Elliott represents domestic and international project developers, utilities and financial players, as well as regulatory and government agencies. Developers, lenders and purchasers on some of Canada’s largest generation and transmission projects have relied on the firm’s counsel. With appreciation for their significant input and assistance, the authors would like to recognize Jason Kroft, Michael Kilby, Patrick Duffy and Vincent Light. 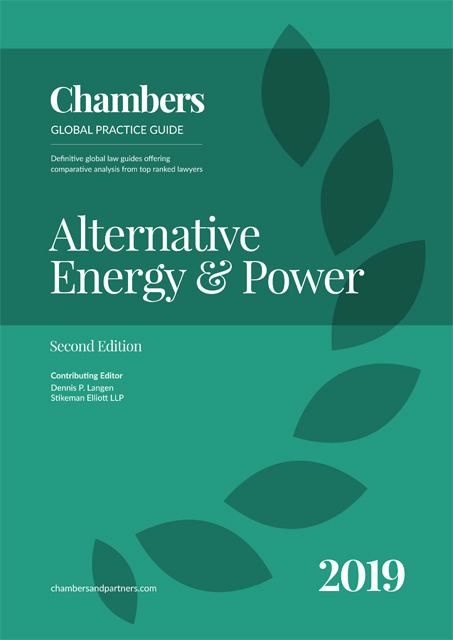 This is the inaugural Chambers Global Practice Guide for Alternate Energy and Power. It is being launched during an exciting and dynamic time in the evolution of the global electric energy and power industry. The desire to de-carbonise and, to a lesser extent, to de-nuclearise power generation has been - and continues to be - a focus in many jurisdictions around the globe. At the same time, and in response, renewable generation in its various forms, including micro-generation, is viewed largely as the way of the future and is garnering more government attention and investor interest than ever before. Carbon phase-out and renewable energy targets are becoming commonplace, as are renewable energy incentive and subsidy programmes. Such change does not occur without creating regulatory, technical and commercial challenges. Governments are assessing their current regulatory, market and rule structures to determine how best to adapt and are doing so within the framework of existing long-lived transmission and distribution infrastructure investment that also needs to adapt to dynamic changes in power supply and consumption. Concurrently, infrastructure developers and investors are assessing the commercial impacts of these changes on existing generation and infrastructure, while focusing on the future and how the commercial landscape for new infrastructure investment is going to change. Evolution within the electric and power industry is a constant. A decade or two ago, many jurisdictions contemplated and experienced material changes in the form of “unbundling” the then widely utilised vertically integrated electric utility model. Not unlike now, the need to adapt or create regulatory, market and rule structures was required to accommodate the unbundling of electric utilities into a mixture of generation, transmission and distribution segments, while also developing and implementing retail and wholesale supply and market regimes. However, the drivers for today’s transformation, as well as the scope and magnitude of that transformation, are significantly different. The changes relating to the unbundling of electric utilities were largely driven by government policy, with the goal of reducing the price of power for consumers through the creation, and opening, of markets in order to incentivise competition from both new and different investment. Today’s drivers are multifaceted and complex. They include: geopolitical factors; the social and environmental awareness and involvement of consumers combined with reciprocal social and environmental governmental policy; and technological advancements in almost all aspects of the industry, including at the consumer level. That is, whereas the changes in the electricity industry that were experienced in the recent past were largely driven top-down though government policy, today’s changes are in response to both top-down and bottom-up stimuli. Governments, the global populace, progressive energy consumers and new technology are driving much of the desire for change, with energy economics playing a smaller, but still important, role. The scope and magnitude of unbundling electrical utilities involved altering the regulatory and commercial models that existed and did not involve much, if any, change to existing electrical infrastructure and how that infrastructure physically delivered electricity to the consumer. In contrast, the changes occurring and being contemplated today go well beyond regulatory and commercial models as they involve the development and implementation of new types of generation and new technologies which require integration into existing infrastructure. Indeed, the desire to replace dispatchable or steady-state carbon-based generation with non-dispatchable and intermittent renewable generation, like wind and solar, raises a real challenge from a reliability perspective at a time when consumers in developed countries view reliable electricity service as a right and not a privilege. This challenge has and continues to drive the need for the development and integration of energy storage technology, which in turn has the potential to cause other integration issues in respect of market and rule design. The current paradigm, which asks the question of whether an energy storage facility is “load” or “dispatchable generation”, needs to evolve. Similarly, the integration of distributed generation technology, in the form of micro-generation and smart grid technology, like storage (eg, electric car batteries), raises further challenges regarding integration as it has never been seen at the electricity distribution level. For this reason, these concepts have the potential materially to disrupt market designs and rules, the physical infrastructure that is in place today, and the commercial and economic aspects of electricity infrastructure as a whole. Notwithstanding that change is occurring, the full scope of that change has yet to be seen. Again, one need only look at the historic example of the unbundling of electric utilities. In Canada, only two of ten provincial jurisdictions unbundled their electricity industry, and of the eight that continued in a vertically integrated manner, approximately half have environments where publicly owned utilities are the only participants. The other half are either fully private or a mixture of public and private. That is, the evolution of the industry through unbundling did not fully materialise in Canada and the result is that the change brought about by unbundling was a matter of degree and not one of kind. However, unlike unbundling, the changes discussed above are driven in no small part by developments in new technology which tends to transcend government policy. In this way the degree to which the existing industry paradigm evolves will be significant, but only time will tell whether that evolution will result in an entirely new paradigm. Indeed, even in the face of efforts to de-carbonise and the push for renewables to replace carbon-based generation, globally the need for carbon-based generation (either coal or natural gas), including new generation, will remain well into 2040. In 2017, the International Energy Agency (IEA) forecast that between 2017 and 2040, global energy needs will expand by 30% and during the same period, presumably to meet the expanding need for energy, a net global addition of 400 gigawatts of coal generation is forecast. At the same time, the IEA estimated that between 2017 and 2040, renewable energy generation will capture two thirds of global investment in electricity generation. This explosive growth in renewable energy (primarily solar and wind) will result, in the IEA’s estimation, in renewable power generation representing 40% of global generation by 2040. In the European Union, this number is estimated to be twice that, at 80%. Globally, the electric energy and power industry is changing and evolving and will continue to do so at a rate not likely to have been seen since its infancy. This means there is, and will continue to be, plenty of opportunity for those in the industry, including legal experts, to develop and apply their expertise. Flexibility and innovation, on the part of all, will be necessary for success. These are exciting times!